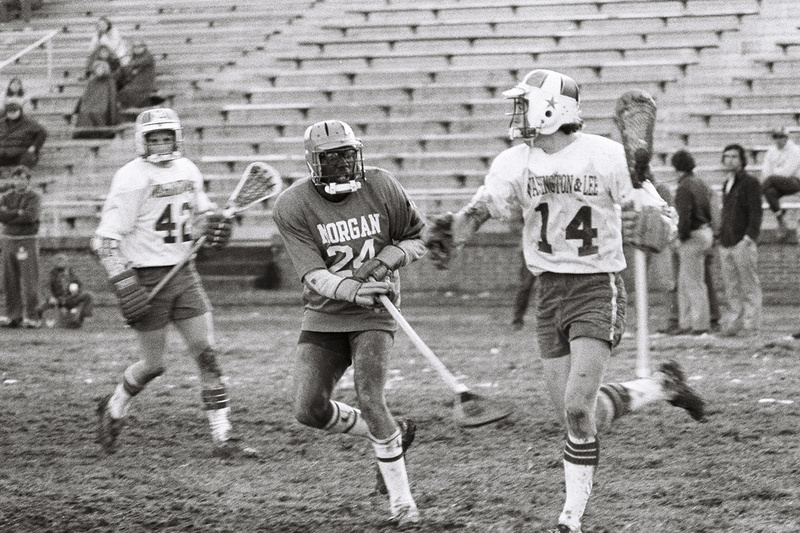 Lacrosse powerhouse Washington and Lee welcomed up-and-comer Morgan State to 3,000-seat Wilson Field in Lexington, Virginia, on March 9, 1975. How did the Division I blue-chip program come to play the Division II team from Baltimore on the rise? 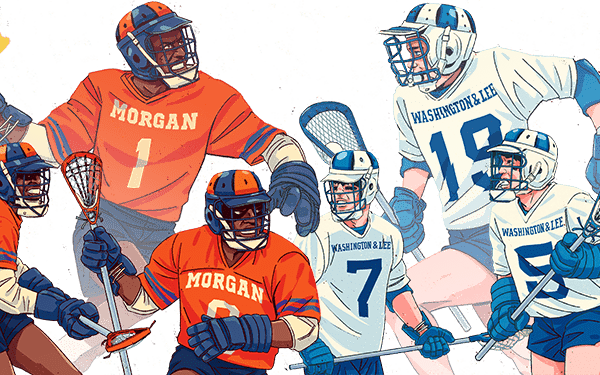 Morgan State coach Chip Silverman became professional friends with Washington and Lee coach Jack Emmer, and after some conversation about the possibility of playing one another, the coaches decided to square off to open the season. This was the third straight year the teams met in the opener. W&L came into the game with a 28-game winning streak in the regular season, two consecutive unbeaten regular seasons and back-to-back trips to the NCAA tournament semifinals. W&L had not lost at home in three years. 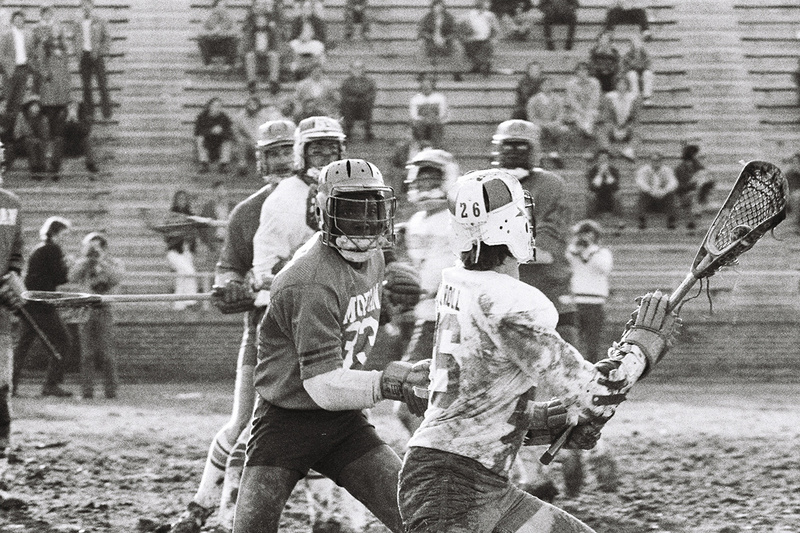 The Bears, the first historically black college or university (HBCU) with a lacrosse team, lost to Washington College in the opening round of the United States Intercollegiate Lacrosse Association’s division tournament in 1973 and would fall to Washington College again in the NCAA’s College Division lacrosse tournament in 1975. Even though the Generals had defeated the Bears the year before, Morgan State was confident this was going to be its year, and it proved prophetic. The Bears defeated No. 1 Washington and Lee, 8-7, in one of the biggest upsets by an HBCU over a Division I program. 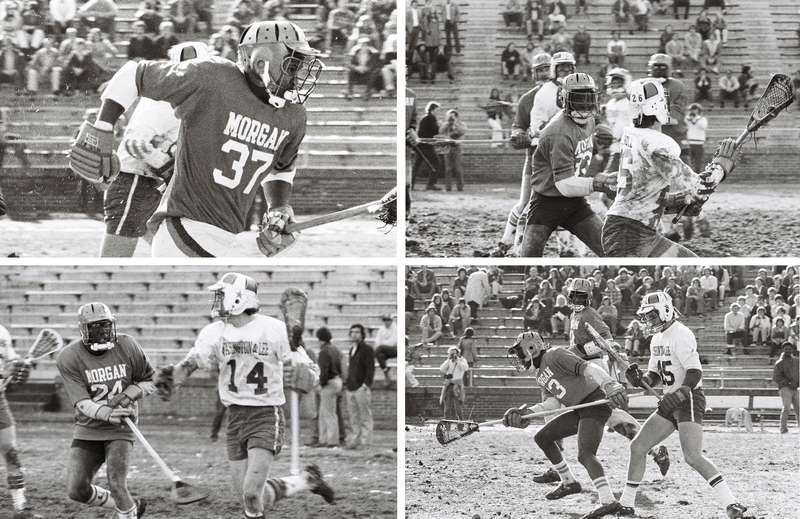 More than 40 years later, members of the Morgan State team gathered at the Lacrosse National Hall of Fame and Museum in Sparks, Maryland, to remember the game – from the bus ride to the meal they had the night before, the play that turned the tide and sitting in the mud when it was over. 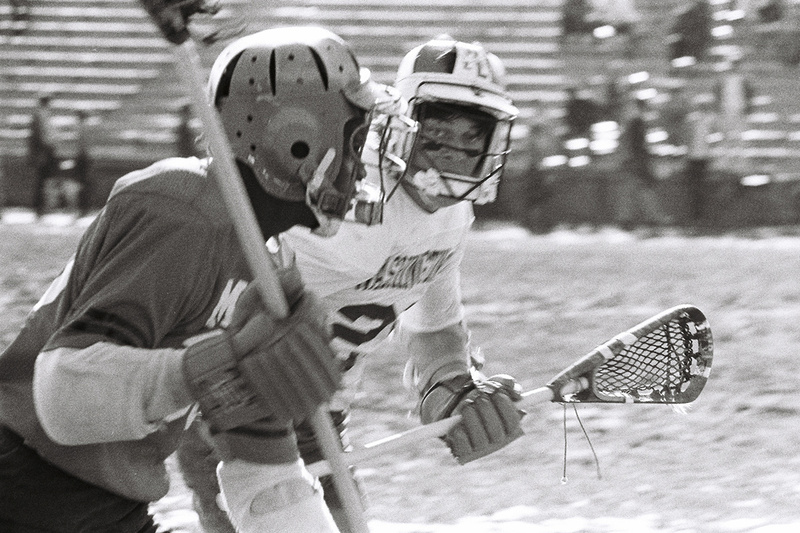 This is an oral history of the game that shook up the lacrosse world. Everyone quoted is identified by the titles they held during that 1975 opener. Emmer said the 1975 season opener had a bit of mystery to it. The Generals had a tremendous amount of turnover from their 1974 unit, which lost several All-Americans to graduation and was coming off a semifinal loss to Johns Hopkins. Morgan State believed that it had a more balanced team to compete with Washington and Lee. That, along with having faced each other before, led to a competitive matchup. In  and , we had two consecutive undefeated regular seasons against the top competition in Division I. Each year we went to the semifinals, so we were quite successful with a bunch of outstanding and Hall of Fame-type of players. In  we were less experienced. We didn’t overlook them by any means. We had to be at the top of our game. Going into that first game, our best attackman, Dave Garfield, had twisted his knee and missed several weeks of games and wasn’t available for that game. The player of the game for them was their goalie [Courtenay Servary]. He was playing out of his mind, and we were all sitting there in shock, watching us barrage the cage with shots and continued to come away empty-handed. When we took the field, I looked over to the side of the field and there were so many old players from Morgan’s team there. I was like, “These guys came all the way down to Virginia for this game?” At one point, it was like we had 12 coaches in the game. Seriously. Everybody was yelling at us what we needed to do, and we’ve got to listen to Chip, but we had like 14 other coaches on the side. That’s when I realized, there’s something to this game that I missed, because I really didn’t know. 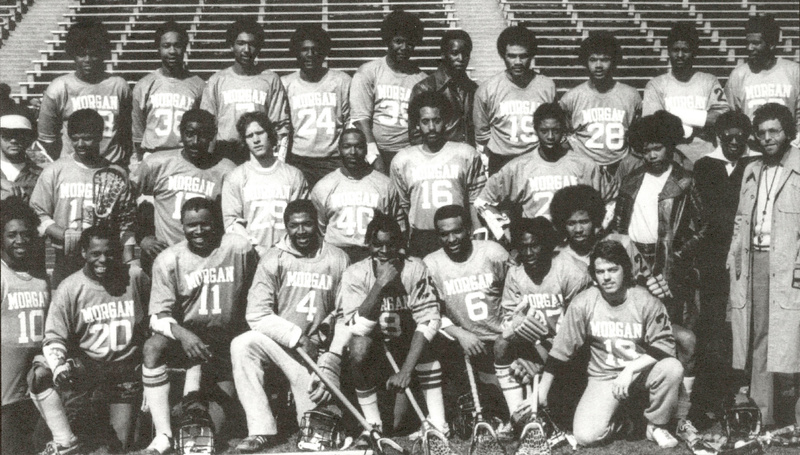 The 1975 Morgan State lacrosse team, including, front row from left, Ed Parker (10), Joseph Fowlkes (11) and Courtenay Servary (13). Second row: George Kelley (17), John Workman (27) and coach Chip Silverman (last in row). Back row: Aaron Glover (24) and Jerna Jacques (26, last in row). Not pictured: Gary Hightower. We were very confident at that particular time; the past two years we had lost. For some reason we had the attack, we had the defense, we had the midfielders who could run with anybody, and we were telling Coach Chip, “Don’t even worry about it. Sit back, have a sandwich. We’ve got this.” We were that confident. We had a balanced team. For the attack squad, myself and Dave Raymond was behind, were very good from behind the cage, but when Mike Walsh came onboard, he was originally also an attack man from behind, but we put him on the crease. One of the things that was interesting that particular year was the way they [Washington and Lee] fed us the night before. I had never had so many carbohydrates in my life at one time. I was a country boy from a farm, and it was like I had never seen shrimp prepared in a way like that in my life. I filled up and gorged, and maybe, just maybe, that had a little bit of an effect. That food was pretty good. That food helped. Nobody was anticipating a tough game, I don’t think, at least from my viewpoint. Not that it was going to be an easy game, but I don’t think anyone ever anticipated the final outcome. Quite honestly, it was a major shocker, but there’s no question about the fact that Morgan State played amazing. They really won the game more than anything else. The Generals jumped to a 5-2 lead in the first half. The top-ranked team in the nation wasn’t happy with its three-goal lead, and the Bears were disappointed by their flat first-quarter performance. In the second quarter, one play flipped the switch for Morgan State, which then held Washington and Lee to two goals over the last two quarters. In all honesty, a 5-2 lead for a team that was so highly rated in previous years, even though they had a loss of talent from the ’74 team, I would’ve expected a bigger halftime lead. I think it was the jitters, playing on a big stage like that. At halftime it was 5-2, and the final score was 8-7, us. We held them to two goals in the entire second half, which is a tribute to the total team effort on defense. [Donny Carroll] was my biggest nemesis. Even that game, he had four goals and one assist. He had half their scoring. We had some key players on defense that made a big difference. We were ready, and the defensive middies played a really good game. [Tyrone ‘Puddie’ Jones] made a big sacrifice late in that game. [The W&L player] was out about 20, 25 feet or so, shot the ball at Courtenay, but here comes superman in prime position, blocked that shot. [The W&L player] took Puddie to the right and juked him and came back left on him, and Puddie was out of position. He was done, and the dude lined up to take a wild shot from the left, and [Puddie] dove five feet in the air, perfectly flat, and he blocked the shot. I remember that play. Laid out. He was tired. It just rolled from there. When you think about it, this was our third year down there, and it was always the first game. Psychologically that was like their homecoming: an easy win, let’s build off it. But it didn’t turn out that way. I’m sure it had to be somewhat frustrating to them. There were two factors: Morgan was playing pretty good team defense, and secondly, their goalie was standing on his head. He was exceptional. He made almost 20 saves in that game, maybe more. We were getting good shots and he was saving everything. We expected to be able to score in double figures, so Servary was very much the difference that day. Morgan State went on the defensive to erase a 5-2 deficit. The Bears limited the Generals, with star player Donny Carroll (four goals, one assist), to two goals the rest of the way. [Emmer] called quite a few timeouts to get them over there to yell at them and jump in their face about how they were playing us, because you could see the momentum swing. At the same time, we started doing some things because we were getting more pumped up about it because we were starting to score. In the second half, the attack put in six goals. It was a situation where they saw us coming: Goal, goal, goal, tied, move ahead. Dave pulled myself and Mike aside, because we were tight that first half, we were. He just basically laid it on the line and said, “Listen, we’ve got to do this. It’s our job. We’ve got to get the job done, so we’ve just got to treat this like any other game and go play our game.” That was basically my attitude at that point, and said, “Well, listen. I’m just going to play my game and we’ll see what happens.” And Dave basically led us through that thing. Last goal was … who scored the last goal? I think Dave put the last goal in. He was just so fast. Dave would pull you out of position as a defenseman and literally outrun you to the cage. I would say to myself, “Don’t you think they’d figured that out after like the 50th time they’d done that to you?” But he’d do it again. We always took pride in the fact that we were a good riding team, but they were able to clear the ball quickly, particularly after Servary made a save. They got the ball downfield quickly. We didn’t do a good job of stopping the fast flow of the game that Morgan State brought with them that day. The one thing I will say is I looked up the statistics of this game and they tagged 32 shots on goal. For our defense to hold a No. 1 to only 32 shots, that says volumes. If you look at that, we were in the right place, doing the right thing at the right time. They dominated us in the third quarter. I think it left everybody kind of stunned that they outscored us, 4-1, in the third quarter. We were just barraging the goal. It was sort of disbelief that we weren’t making a comeback, and it was one of the most shocking things to witness. At the same time, it was just an amazing feat to witness how we attacked the goal and could not get a score by Courtenay. As the final seconds ran off the clock, the reality of the win began to sink in. Washington and Lee players moved into the locker room, while Morgan State players stood on the field taking in the victory. Some players collapsed on the ground. It seemed like it was winning the World Series. I really didn’t celebrate too much. I just sat back and watched everybody. I was trying to get Courtenay up off the ground. When the game was over, I just sat down in the mud, and I did not move because I had just laid it all out there. I was shot. I was emotionally shot. We could never get that tying goal past Courtenay. He was just a brick wall. Every time we’d take a shot, the ball would hit him or he’d make the save or it would top off his stick. It was just an amazing display of goaltending. 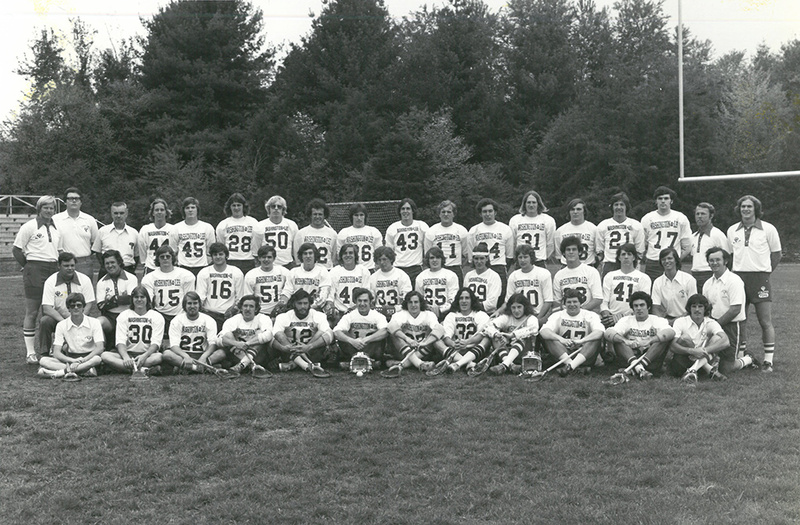 The 1975 Washington and Lee lacrosse team, including front row, sixth from left, Charlie Brown. Third row, first from left, coach Jack Emmer. I think our guys were discouraged, because here we had two straight undefeated seasons. We were one of the top three teams in the country, had been to the semifinals the last two years, and to start off the season in ’75 with a loss was humbling for us and very much an eye-opener. We didn’t feel like we had looked by them. We didn’t feel like we had taken them for granted. We just felt like on that particular day, with Servary hot in the net, that they were the better team. We were leading, 8-7, and they were chasing that 8. They were chasing it big time. Those last two minutes they were like wild men after it, and our guys were just about as wild as they were, which worked out real well. The lovely part about that whole thing, too, was the fact that Jack Emmer, their coach, came on the bus at the end. And congratulated us and gave us praise. It showed a lot of class. I made the effort to seek Morgan State out on their bus and told them they earned it, they should feel good about themselves, and it wasn’t a fluke and good luck for the rest of the season. With the Lacrosse Hall of Fame as the backdrop, the Bears reflected on what the win meant in that moment, what it means now and what it will mean for the future. 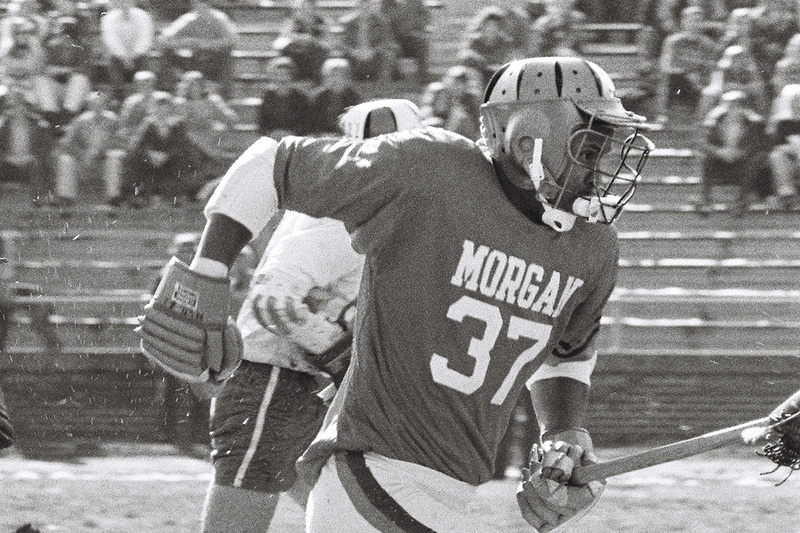 Morgan State stopped funding men’s lacrosse after the 1981 season, and the team was disbanded. 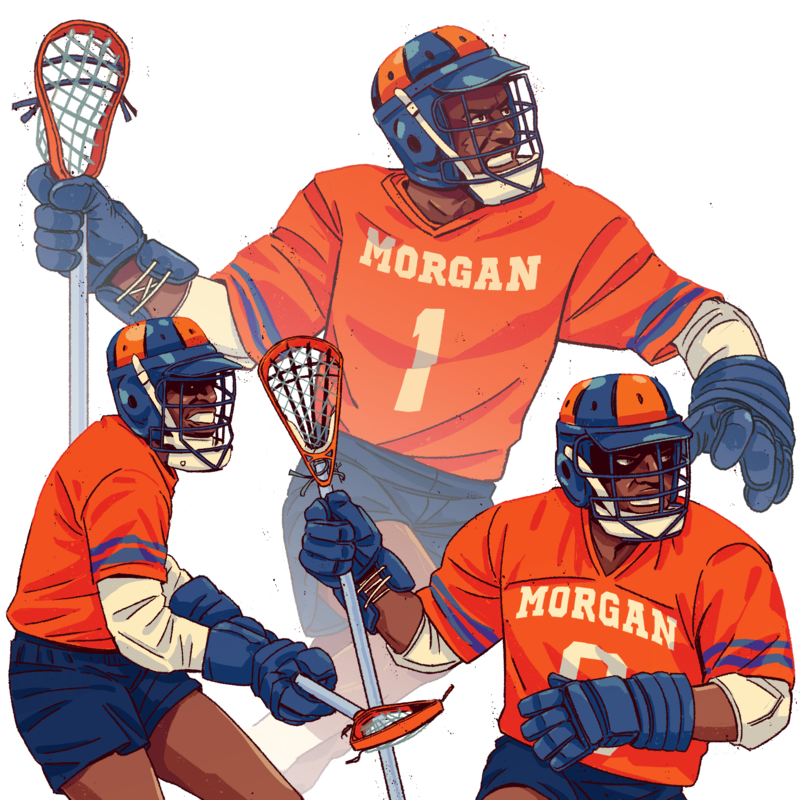 Morgan State has an intramural lacrosse team, but there are no plans to revive the varsity program. When we got on the bus in Baltimore to leave for Lexington, we had it in our minds that we were going to win that game. And then, at the end of the game, when that final whistle blew, then we had done it, it was just the overwhelming feeling of accomplishment. 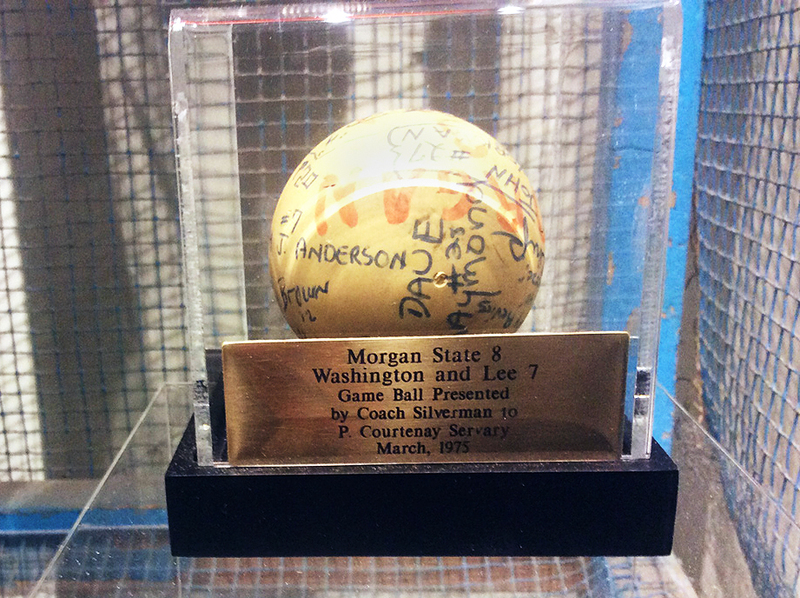 The game ball, presented to Morgan State goalie Courtenay Servary, is displayed at the Lacrosse National Hall of Fame and Museum. 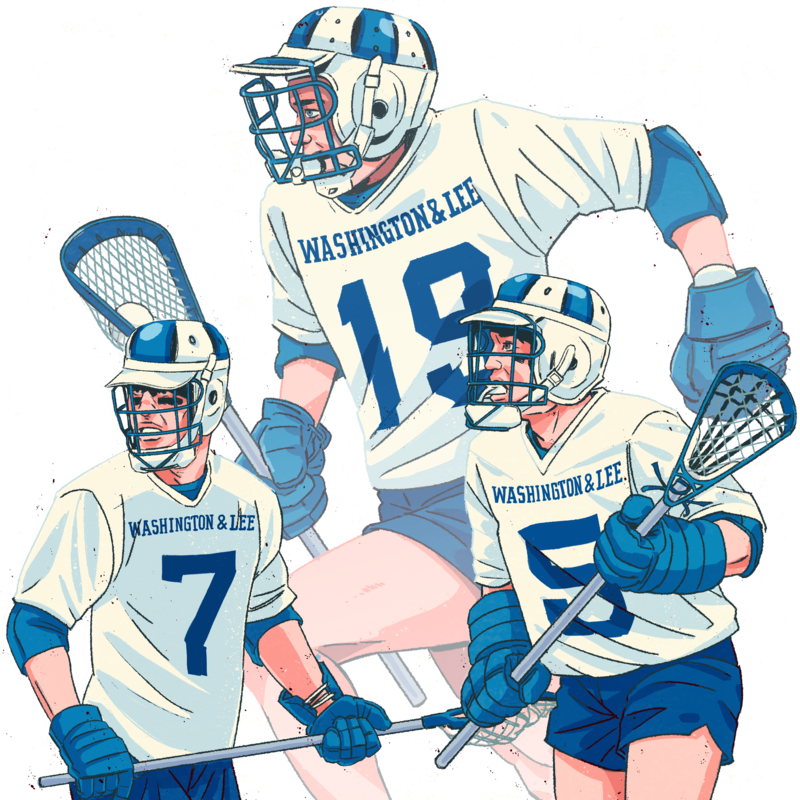 We had a certain pride because we loved the game of lacrosse. The thing that I would tell everybody is that you’ve got to really come out and see us. You’ve really got to come see how we play this game. It’s not a black game. It’s not a white game. It’s the game of lacrosse. To me, the No. 1 thing it means to me is it may be the first step to getting a team back to Morgan. That, more than anything, is a key ingredient for me. I think a team needs to be there; they also need to get a women’s team there too. I think there’s enough talent in this area that they can draw players. I don’t think that’ll be an issue. That’s a big plus. I look forward to that. I would love to come back to a lacrosse game at Morgan. I would. That would be really something special. We are hoping that happens. Through that exhibit behind us [at the Lacrosse Hall of Fame], we all live for each other, and at the same time, we all live in history, because when you look back at it, it’s a symbolism that everyone will see. They may not know us personally, they may not understand it, but at least when we get together, there’s a camaraderie that we share about the unity and love that we have. In today’s society, to say that you love another man can take on a different connotation, but that love that we have for each other … I expect them to be doing well and representing me well because we are a part of each other. Even if we don’t get to hang around each other, when we do see each other, it’s like we saw each other yesterday. Jack Emmer: Retired, Hall of Fame lacrosse coach. His 326 collegiate wins ranked No. 1 in the sport until 2008. Chairman of the selection committee for the Tewaaraton Award, given to the most outstanding college player, and chairman of the Outstanding Assistant Coach Award. Charlie Brown: CPA, executive vice president/chief financial officer for AETEA Information Technology Inc.
Edward Parker: Modular manager, Social Security Administration. George Kelley: Retired officer from the Baltimore City Police Department and the Baltimore County Sheriff’s Office. Jerna Jacques: Longshoreman, International Longshoremen’s Association Local 333. Courtenay Servary: Retired elementary school teacher and administrator. Joseph Fowlkes II: Retired security officer, Union Memorial Hospital. Gary Hightower: Pulmonary function technologist, Memorial Sloan-Kettering Cancer Center in New York. John Workman: Business development consultant and broker/owner, JA Home Sales.